Mugello is the most important and special race of the year for me. It means so much to me, to race here in this idyllic paradise nestled in the hills of Toscany. This is the Homesoil and Heartland of D-U-C-A-T-I. This is the Italian Grand Prix, where the most fervent, passionate, and religious fans congregate to salute the Magic and Majesty of Motorcycle Racing, and it's current King, il Re di Mugello, Valentino Rossi. Mugello has so much meaning to me, it holds such a significance in my life, that I came here with great expectations, high hopes, and more anxiety and trepidation than I've ever experienced before a race. 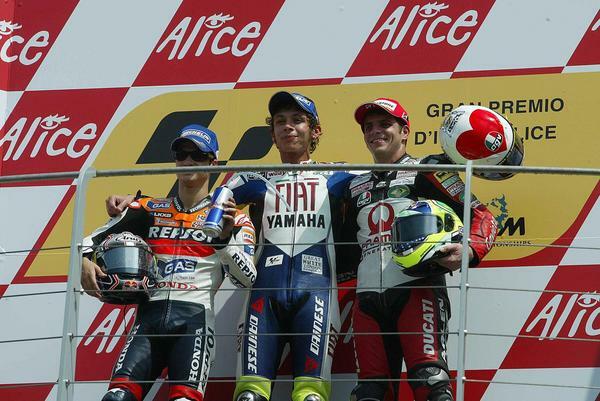 For this was not just "any race", this was Mugello. The Big One. The King of Races. Mugello is everything you could ever ask for - it is Wild, Beautiful, Breathtaking, Stunning, Overpowering - and Mugello is where I scored my debut Podium with Alex Barros and our Pramac D'antin Ducati! On Sunday, we put a Ducati on the box. Not just any Ducati, but a Pramac D'antin Ducati. A Satellite Ducati. My Ducati. And I want to do it again. It didn't rain during the race, until afterwards, as tears of pure happiness began to fall. The Team is now in Barcelona, and we're having a team dinner in the city not far from my apartment. Afterwards, I'll be back home packing for an early morning drive to the circuit where we'll begin to put everything together for the Catalunya GP, because it's time to do it all over again. I will most likely have a very late night, because I want to capture all that is Mugello before I switch gears and get into the next race. The racing never stops, and neither will I. On behalf of the Team and myself, I want to say Thank You to everyone for the emails and phone calls. I will do my best to respond to all of you, but please understand if I can't get to you at this moment. I am busy shooting for the stars. We are pushing to create our own destiny. And we are more focused and motivated than ever before. Beware the Squadra delle Pecore Nere, because we are here, and we're here to fight. Awesome finish for you guys. And nice job with getting CE to pop the shocker now.. lmmfao. Congratulations! That was an exciting race. I can only imagine what it was like to be right there, trackside. I'm going to be @ Laguna Seca in July. I've got paddock passes so maybe I'll see you there! Fantastic Liam watched it on TV here in UK and saw you after the race, not once but twice. Really, really looking forward to reading more herev and listening to you on MotoGPOD. Congrats to you all. You could be seen on the US feed as well. Congrats mate!! to you, Alex and your whole team... Although I was gunning for Casey (im an ozzie) ...i was very happy to see Alex up there, he fought an awesome race!! Just for the record...Does Pedrosa ever seem to be happy, he always looks so sour and unhappy ...cheer up Dani, you are one of the luckiest people in the world ...embrace it!! Yo Liam! Just finished watching the race. 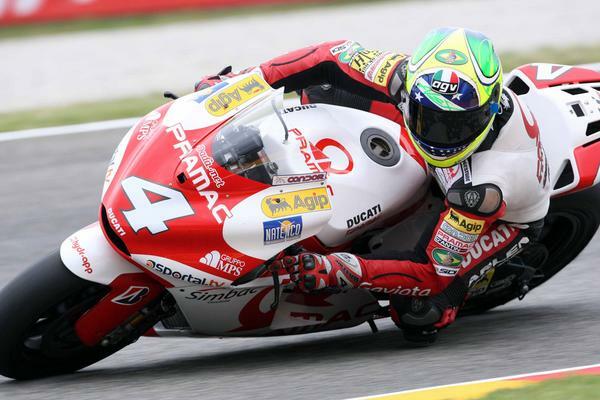 Congratualtions to you and the Pramac Team.....and to Alex! You had that bike singing! Saw you at Parce Ferme.....GOT to feel great! See you online at Catalunya! Sono proprio brave le pecore nere !! Keep the posts coming - we love 'em down here in Oz. Thanks for keep that drum raindance group out of the (sunday) grid, dude! We all cheered for Barros, it was big news here, so are you,congrats, my friend! And here comes more champagne, fingers crossed for Montmeló. And please, when you can, put a Mugello podium music on, bro! Congrats on the podium! Was great to see you on tv after the race! Awesome result which thanks to the live coverage on www.motogp.com I could watch here in my hotelroom in Hongkong. Dunno who the Pecore Nere are but, I kinda like them! Thanks for a great dinner... My spirit will be with the team on Sunday morning, I'll be at the track, on the inside of the first corner!!! Your a star! Good Luck in Catalunya.